Pop star Rihanna has been putting in some “work” on global education efforts, and a meeting Wednesday with France’s president appears to have paid off. President Emmanuel Macron said on Twitter after the pair met in Paris that he is "committed" to helping address the challenge of 264 million children being out of school. He mentioned the social action platform Global Citizen and a nonprofit founded by Rihanna, the Clara Lionel Foundation. 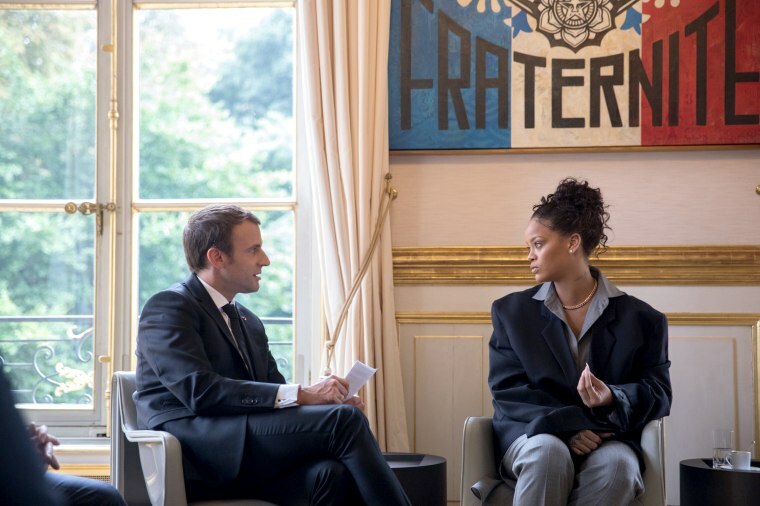 The the Global Partnership for Education said Rihanna, its global ambassador, met with Macron about the urgency to fund global education. "We focused on the topic of education from global aspects, and we will make a very big announcement this coming September," Rihanna told journalists outside the Elysee palace in Paris after the meeting, without elaborating, according to Reuters. Thank you Mr. President @EmmanuelMacron and Madame First Lady for the incredible meeting and passion for global and girls education! The "Work" and "S.O.S." singer has made appeals to the leaders of several countries, including the leaders of Canada and Argentina and Germany's government spokesman Steffen Seibert, on Twitter recently asking that they support education funding efforts. Rihanna has more than 75 million Twitter followers. The Global Partnership for Education is in the midst of a "replenishment 2020," which aims to raise $2 billion a year by 2020, funds that the organization says will support 89 countries where 78 percent of the world’s out-of-school population reside. The Clara Lionel Foundation says it supports and funds "innovative and effective education and health ​programs around the world." It also funds a scholarship program for citizens and natives of Brazil, Barbados, Cuba, Haiti, Grenada, Guyana, or Jamaica who want to attend college in the United States. Rihanna herself is a native of Barbados. Canadian Prime Minister Justin Trudeau responded to Rihanna's call to action with a tweet that read in part "we've got your back!" and that Canadian Minister of International Development Marie-Claude Bibeau has "made sure girls' education is in our feminist international development policy." Germany's Seibert said in a reply to Rihanna last month: "education is a key area of German development policy. We have nearly doubled spending since 2013.Thanks for spreading the word!" And Argentina's President Mauricio Macri‏ replied to the call for action with the message: "Education is in the central core of our political aims. Only education can change the world."